Refrigerators that have an ice maker or dispense ice and water through the door possess a small copper water supply line. The supply line has a valve attached to it so you can turn off the water to the refrigerator without disrupting service to anything else. The type of valve used on a refrigerator supply line is usually a saddle valve. The saddle part of the valve fits over the line in a manner similar to a saddle on a horse. The hardest part of shutting off the valve may be finding it. Locate the water supply line on the back of the refrigerator. The line is usually made of copper and is smaller and more flexible than standard copper plumbing. Trace the line from the refrigerator to where it is connected at the other end. Look for the saddle valve as you trace the line. The line usually runs under the sink, where it is connected to the water source. 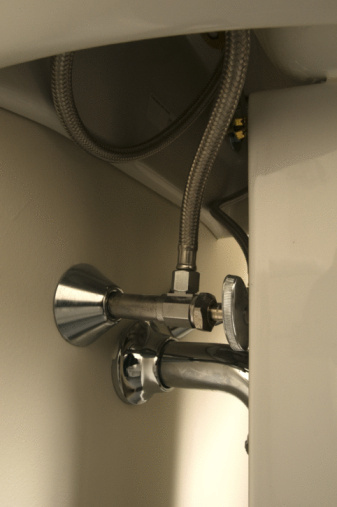 The saddle valve is usually located under the sink, but it may have been installed elsewhere on the line. Turn the handle on the saddle valve clockwise to close the valve and stop the supply of water to the refrigerator.